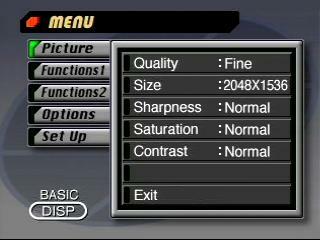 The advanced manual controls and features are accessed via a graphical menu system on the color LCD. 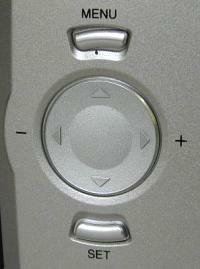 The 4-way rocker switch and the buttons above and below it are used to navigate menus and select options. 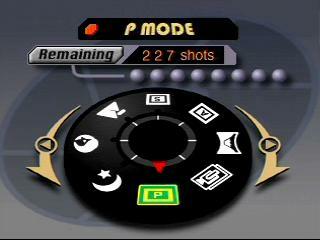 This is the Mode menu, it's activated when in record by pressing the Mode button on the top of the camera. Unlike other cameras that have a physical dial selector the QV-3000EX uses an onscreen menu to select the desired operational mode. 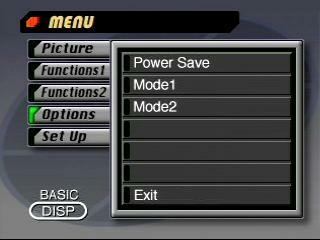 This is the Picture menu the user is presented with when in Record mode when the Menu button is pressed. Options are clearly marked and easy to navigate using the 4-way rocker switch next to the LCD. Image size of 2048x1536 or 1024x768 can be selected and your choice of three JPG image compression levels (Fine, Normal, Economy). You can also select the desired amount of image sharpening (Hard, Normal, Soft), color saturation (High, Normal, Low) and contrast (High, Normal, Low). 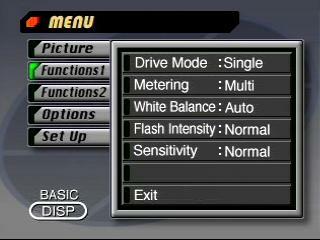 This is the Functions1 menu screen, here you can select the Drive Mode (Single or Continuous), Metering (Multi, Center, Spot), White Balance (Auto, Manual, Daylight, Shade, Tungsten, Flourescent), Flash Intensity (Normal, Strong, Weak), Sensitivity (Normal, +1, +2, +3). The variable sensitivity relates to ISO values of 100, 180, 300, and 500. When using the higher ISO values the images are visibly noisy especially if used in conjunction with longer shutter speeds. The variable flash output intensity is a nice feature that allows you to use any amount of flash desired for fill or macro operations. The QV-3000's redeye reduction mode emits the usual pre-flash which I find to be good only to make sure your subjects have their eyes closed when the actual picture is taken. 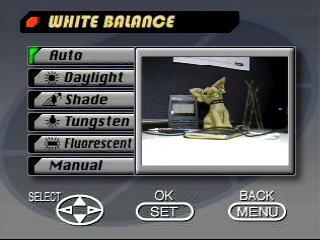 Speaking of white balance, here's that menu screen including a manual white balance setting option -- which all digicams should have but few do. And a really neat feature is the live onscreen preview so you can "see" what the different white balance values do in realtime. 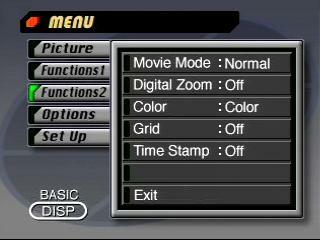 This is the Functions2 menu screen, here you can select Movie mode (Normal, Past), Digital Zoom (Off/On), Color (Color, B&W, Sepia), Grid (On/off), Time Stamp (Off, YMD, D H:M, YMD H:M). This is the Options menu screen, here you select the power saving settings for the camera or select the user-configurable Mode1 or Mode2 settings. 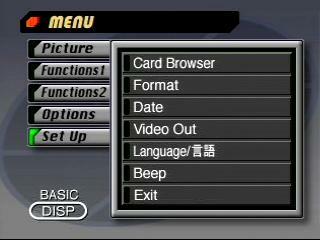 This is the Setup menu screen, here you can select the type of Card Browser you want generated (Off, Type 1, 2, 3, 4). This is a really neat feature as the camera generates HTML-formatted pages to display the index of your pictures. You can use Netscape or IE to "browse" your stored images, see my QV-2000 sample pictures page, this was created in the camera itself. The other options are: Format a memory card. Specify the format of the Date information. Set the Video Out signal for NTSC or PAL. Set the menu language (English, Japanese). And turn the Beep tone On or Off. It is possible to install a codec which will allow Windows 95/98/NT Media Player to play the Casio-generated AVI movie files. Download the Motion JPEG Codec, and extract it to a diskette (be sure to have the "use folders" option checked). Open the appropriate folder (see the readme.txt file), and right click on the MCMJPEG.INF file, select install. Now when you click on the AVI file it should open with Windows Media Player.